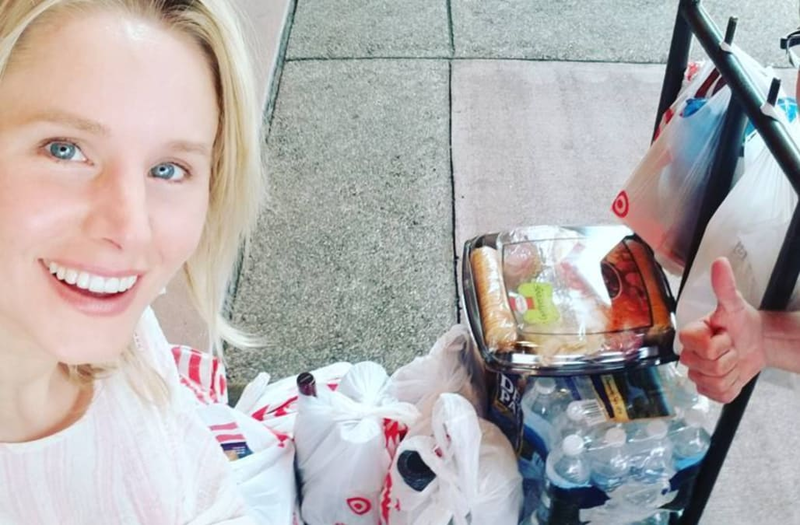 Kristen Bell is staying positive in wake of Hurricane Irma. The 37-year-old actress took to Instagram on Friday to share that she is bracing for the destructive storm after not being able to evacuate Orlando, Florida, where she's been filming her upcoming movie, Like Father. "Last run to the store for #irma hurricane holdover prep while bracing down in Orlando. We didn't have the option to leave so here we are," Bell wrote alongside a picture of herself and Disney World Swan and Dolphin Resort employee, Gary. "Just doing our best and trying to stay positive but cautious, and trying to help those who need help prepping. Every person I passed today was assisting someone else- #neighborshelpingneighbors - it was beautiful to see." Last run to the store for #irma hurricane holdover prep while bracing down in orlando- we didn't have the option to leave so here we are. Just doing our best and trying to stay positive but cautious, and trying to help those who need help prepping. Every person i passed today was assisting someone else- #neighborshelpingneighbors - it was beautiful to see. Sad that a hurricane has to bring out the best in everyone- but happy that the community will be holding hands through this. Im grateful to Gary and the team at @swandolphin in epcot for helping us feel safe while we get through this together. "Sad that a hurricane has to bring out the best in everyone, but happy that the community will be holding hands through this," she continued. "I'm grateful to Gary and the team at @swandolphin in epcot for helping us feel safe while we get through this together." Earlier this week, Bell tweeted that she and the cast and crew for Like Father were going to try and evacuate. Unfortunately, they weren't able to do so. The Frozen star then updated her fans with a pic of herself with her two co-stars, Paul W. Downs and Blaire Brooks, having "one last beach visit" before the storm. Hurricane Irma comes after Hurricane Harvey, which hit Houston, Texas and surrounding states. Since hitting the area, celebrities like Beyonce, Jennifer Garner and Kevin Hart have been donating and giving back to the affected communities. Drake gave $200,000 in response to Kevin Hart's public call for celebrity donations. Of his $1 million donation, Tyler Perry delegated $250,000 to Joel Osteen's Lakewood Church. Leonardo DiCaprio donated $1 million to the United Way Harvey Recovery Fund. In the past, he has made hefty donations to victims of the 2004 Indian Ocean tsunami, the 2010 Haiti earthquake, and Hurricane Sandy in 2012. Ellen DeGeneres teamed up with Walmart to announce a $1 million contribution to a relief fund established by JJ Watt, boosting him closer to his goal of $10 million in donations. Miley Cyrus began crying on "The Ellen Show" after Ellen DeGeneres announced Miley would donate $500,000: "My grandma's sitting here, and my mom's sitting here, and I go home to my seven dogs, and if I didn't have that anymore, it'd just be really hard," she said through tears. The Kardashian/Jenner women -- Kim, Kourtney, Khloe, Kris, Kylie and Kendall -- announced a joint $500,000 personal donation to hurricane victims. The first major celebrity to make a public donation, Kevin Hart successfully rallied other celebrities to join his fundraising efforts. He pledged $50,000. Dwayne "The Rock" Johnson was one of the first celebrities to donate to relief causes, offering up $50,000 in response to Kevin Hart's campaign. DJ Khaled dropped $25,000 and offered his prayers to the people of Houston. Nicki Minaj re-posted Kevin Hart's public video plea on Instagram and announced she'd donate $25,000 to the cause. Alex Rodriguez and Jennifer Lopez each donated $25,000 and urged their followers to consider contributing to the Red Cross as well. Green Day gifted a $100,000 donation to Hurricane Harvey relief.